Roadways Removals have been providing Port Macquarie to Canberra removalists services for years. We have been in the business of interstate removals for a considerable number of years and is today among the most reputed in the business. 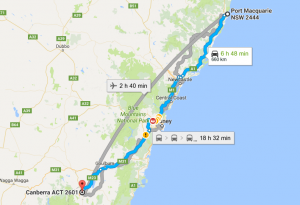 Roadways provides a full complement of Port Macquarie to Canberra removalists services from – pre-packing, transport, unloading, storage, you name it, and Roadways delivers with a smile. One phone call is what it takes to get a prompt response by one of our representatives, who will discuss your requirements, offer you friendly advice and then draw up a comprehensive but easy-to-understand estimated cost that will prove to be the perfect solution to your interstate removals headache. Transport: Removals at Roadways are prompt as we have our own network of trucks manned by experienced drivers who have been specially trained to deliver your belongings safely and swiftly. You can even entrust your car to us if you are not inclined to drive to your new home. Since we have a large fleet of vehicles available and a substantial amount of traffic between the more popular destinations, we are also able to offer you our special backloading services which allow transport of small consignments that do not call for the hire of a full truck. Your load can be accommodated in the vacant area of the first truck heading your way. Storage: Items not required by you at your new residence may be kept for as long as you want in one of the many conveniently-located furniture storage units. These units are modular and provide for secure storage of your belongings for as long as you want. Pricing is affordable and is based on the frequency of access desired by you. Packing: The basic step of the relocation makes all the difference between a massive pain and an easy smile on the face. Our expert packers use virtually every trick in the book to pack your household effects securely and safely to undergo no harm during transit. While most of the items would be carefully packed into standard-sized double-walled rigid cardboard cartons, the odd-size items are specially packed with appropriate padding and wrapping for best security and transport. Best Port Macquarie to Canberra Removals. If you need reliable Port Macquarie to Canberra removalists, Roadways Removals is ready to get the whole process on the way today!